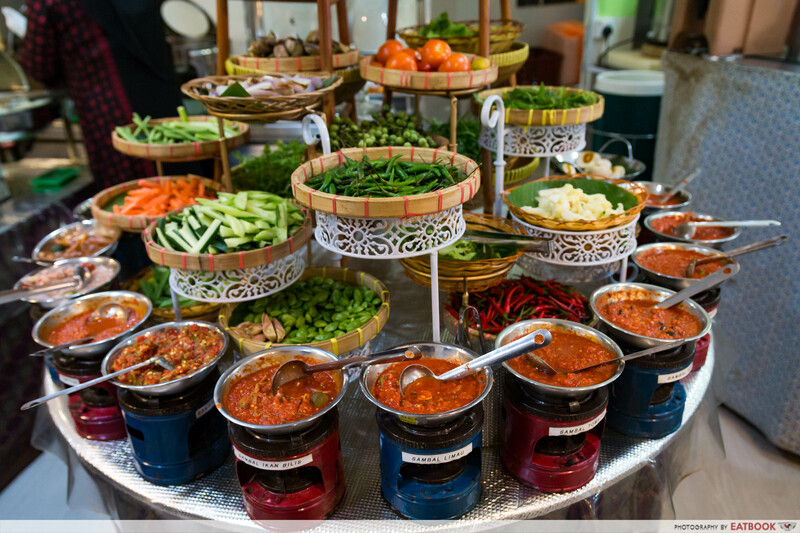 Dine at these halal buffets! 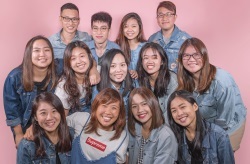 While the end of the year signifies the anticipation of a well-deserved holiday, it also calls for reunions and team gatherings to celebrate the festive season. For all the fun that comes to mind when we think of these social gatherings, an inevitable struggle lies in choosing a venue that is group-friendly. Working with a huge team of foodies who goes for team dinners every month, I know the pain. 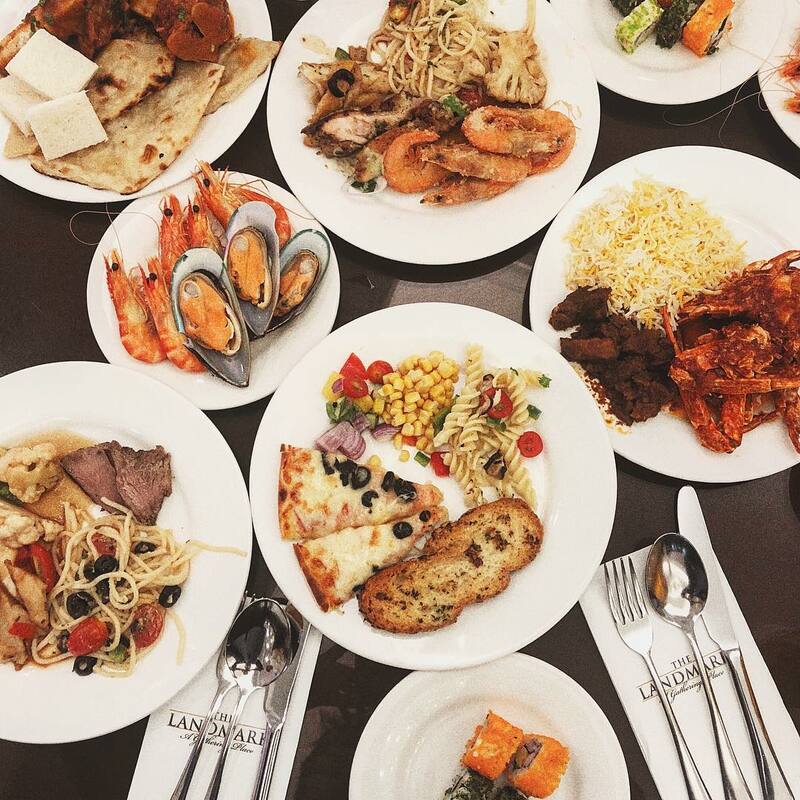 So in this list, we have found nine places serving affordable halal buffets, from international cuisines to delicious Indonesian food and unlimited pizzas! If you think having a good all-you-can-eat meal at Orchard at less than $20 is impossible, you are wrong. At International Building, you can find The Rice Table, a restaurant that has been serving Dutch-Indonesian cuisine for over 20 years. At $18.95, you can get their All-You-Can-Eat Rice Table Lunch that comes with unlimited top-ups of 14 different Indonesian dishes. The 14-course buffet includes vegetables, meat dishes, and a soup. Some of our favourite dishes were their Ikan Goreng, Sate Ayam, and Tahu Telor. 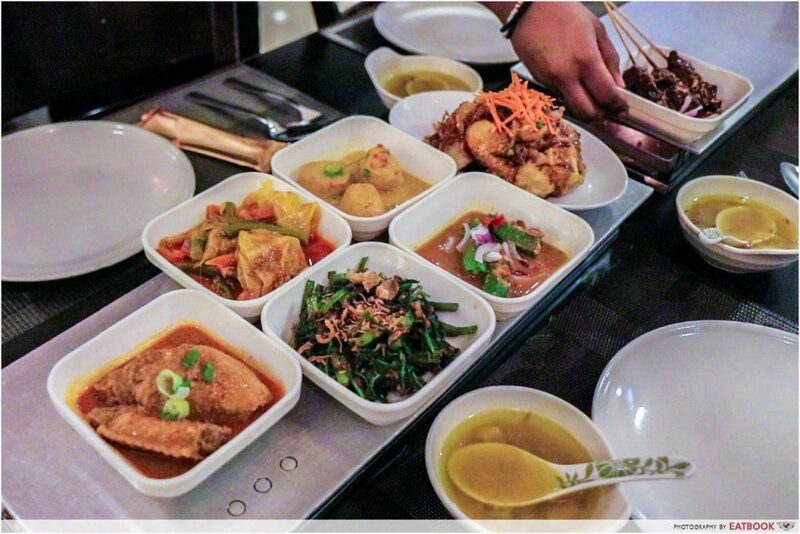 Their 20-Course Dinner Buffet ($29.55), which starts at 6pm, includes additional dishes such as Sambal Udang, Sotong Asam, and Perkedel Jagung! Check out our full review of The Rice Table! *According to their menu, The Rice Table uses halal ingredients but the restaurant is not halal-certified as they serve alcohol. If you are one who loves spicy food, especially sambal, Aroma Kampung is your heaven. 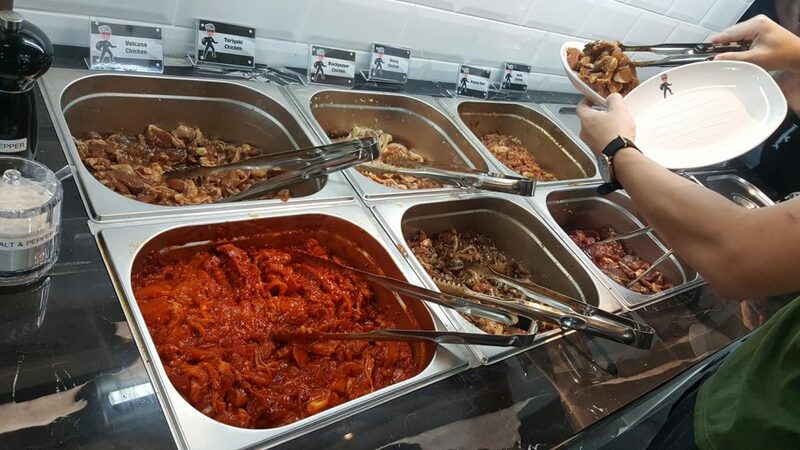 This Muslim-owned eatery specialises in nasi padang buffet, with more than 40 dishes and 12 types of sambal, namely kosong, kecap, petai, ikan bilis, limau, belimbing, budu, mangga, tempoyak, selasih, tomato, and cincalok. 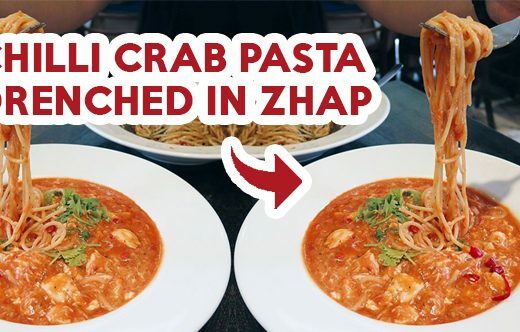 Out of the 40 dishes, some of the must-haves here are Deep-Fried Chicken Skin, Ayam Lemak Chilli Padi, and Siput Sedut Lemak Chilli Padi – snail flesh cooked in chilli padi gravy. Of course, a nasi padang is not one without the nasi. At Aroma Kampung, you can get two types of rice: white rice and nasi kerabu, which is stained blue with butterfly pea flowers. Aroma Kampung is a Muslim-owned eatery. If there is anything better than Portuguese Bird Nest Egg Tart, Hiroshima Oyster Omelette, and Signature Boston Lobster & Argentine Red Prawn Hokkien Mee, it would be having unlimited portions of them. At Sakura International Buffet Restaurant, that is exactly what you can get. Starting at $22++ for a weekday lunch, you can also expect a huge variety of dim sum, Thai food, and sushi. Although it’s hard to resist, try to leave a little space in your stomach for their desserts like Bu Bu Char Char, Lava Cake With Haagen-Dazs Belgian Chocolate Ice-Cream and Dark And White Chocolate Mousse! Sakura International Buffet Restaurant is a halal-certified eatery. If you are bored of the usual buffet spread, Rhombus Pizza is where you should check out. 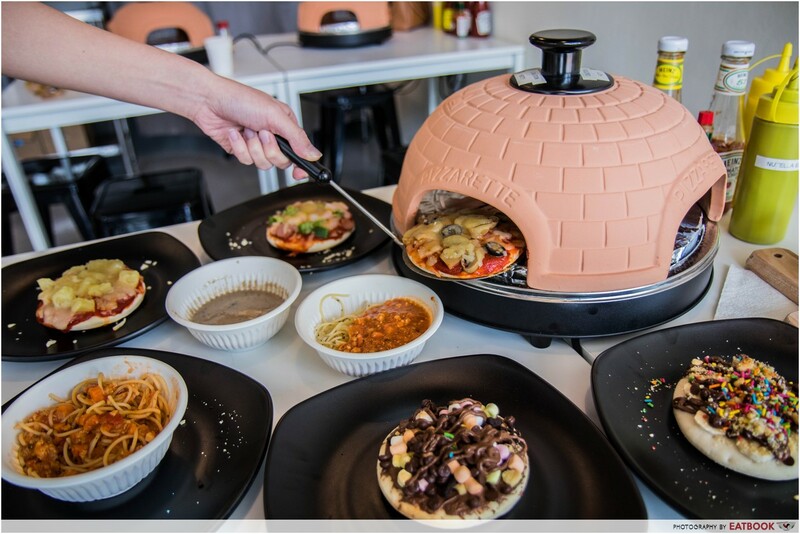 At $15, you get to help yourself to the selection of ingredients available and make as many four-inch pizzas as you can eat in 90 minutes. From spreading the sauce to adding toppings and baking the mini pizzas, everything is D-I-Y! For the toppings, you can find meats like ham, sausage, and pepperoni – all made of chicken meat – as well as mushrooms, prawns, and capsicums. Besides the sweet toppings that are available for you to make your own desserts, they also have a corner featuring free-flow sides. Some dishes that you can find are spaghetti bolognese, mushroom soup, and baked chicken drumlets! Find out more about our experience at Rhombus Pizza! Rhombus Pizza is a Muslim-owned restaurant. 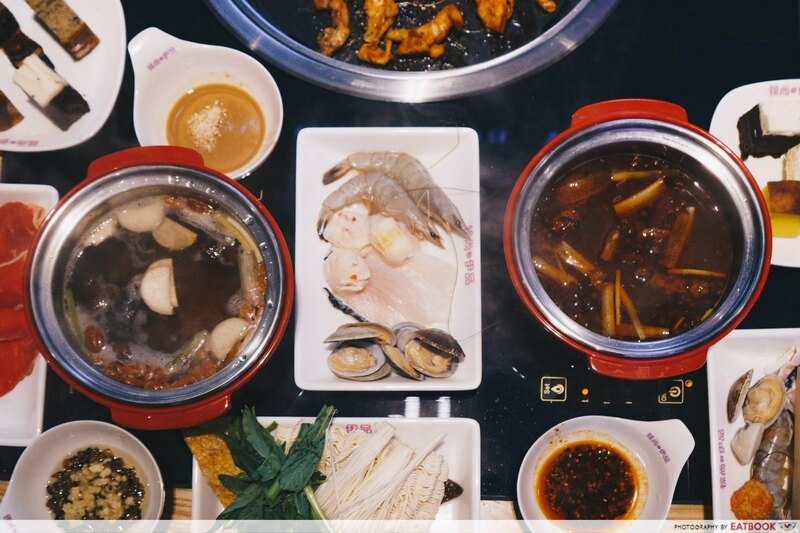 Owned by Muslims who hail from China, Jin Shang Yi Pin Buffet Hot Pot is as authentic as a halal Chinese hotpot restaurant in Singapore could ever get. The buffet is priced at $35++ for adults and $22++ for children, and includes a pot for each diner, as well as unlimited meats, veggies, drinks, rice and desserts. For an additional $4.90++, there’s also the option of a barbecue grill. Fans of all things spicy should definitely get the mala broth that’s loaded with peppercorns, giving you a lip-numbing sensation. The restaurant also has a dessert corner and a sauce station with over 10 options from creamy peanut sauce to savoury mushroom sauce. Best part is, there’s no time limit so feel free to indulge to your heart’s content. Jin Shang Yi Pin Buffet Hot Pot is Muslim-owned. Westies can now enjoy halal-certified mookata at a spot in Jurong East called Chickata! Their 90-minute a la carte buffet ($18.80 for adults, $9 for children aged 7 to 12) is only available every Monday to Thursday, 3pm to 11pm, and includes a spread of meats, seafood, veggies, and staples. Recommended dishes include tom yum chicken, teriyaki chicken, black pepper beef, and black pepper lamb which all came in huge portions. The tom yum chicken absorbed the spicy and sour marinade well, and retained its juiciness and tenderness despite being grilled for a while. If you’re not in the mood for mookata, they also have Western food platters you can enjoy with your family or friends. Chickata is a halal-certified eatery. Located a short walk away from Bugis Junction, The Landmark is one of the largest halal-certified buffet restaurants in Singapore that offers Western, Mediterranean, Northern Indian, and Asian cuisines. At $25++, the variety and quality of food that you can expect at their lunch buffet is almost too good to be true. For seafood lovers, you will be thrilled to know that they serve crabs, Spanish green mussels, and scallops every day! Some other interesting dishes that you can also find at the restaurant are Stuffed Grilled Chicken with Rosemary Sauce, Fish Head Curry, and Assorted Naan & Tandoori Chicken! The Landmark is a halal-certified eatery. 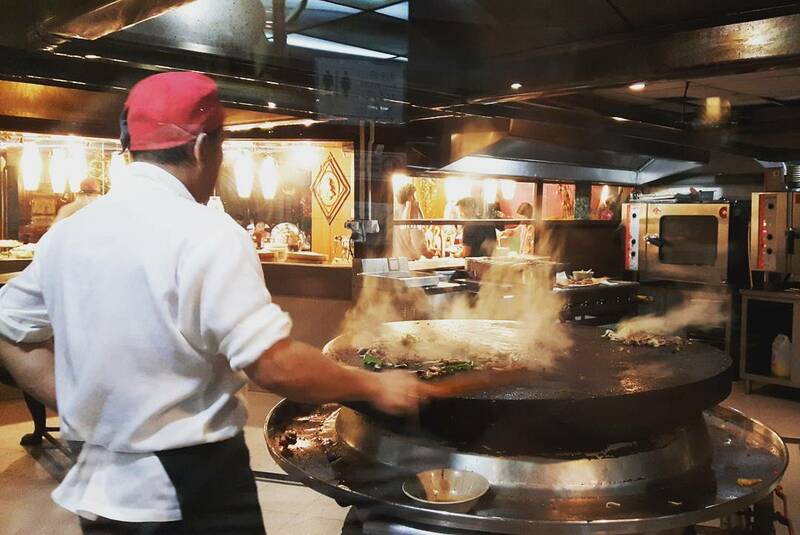 Overlooking the Singapore River, Kubai Khan Mongolian BBQ is a buffet restaurant located on the second level of Clarke Quay Central. The highlight of this restaurant is the gigantic barbeque pit that their chef uses to cook meat. 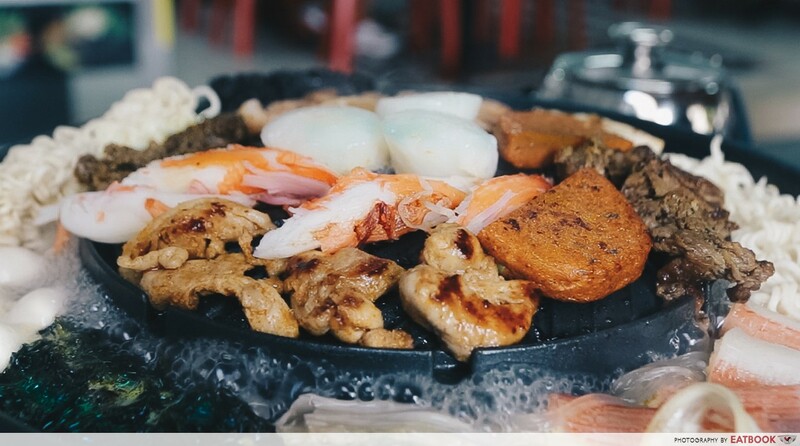 Prepared in Mongolian style, a variety of meats such as chicken, lamb, and beef are barbequed on the spot. Besides Mongolian barbequed meat, the restaurant also offers Japanese cuisine with sushi and sashimi selections, Chinese cuisine, and a wide variety of desserts. 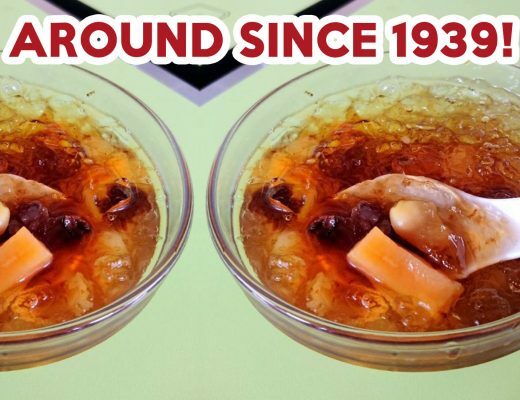 Some of their most popular finger food that you can expect include Mongolian Mushroom Balls, Breaded Salted Egg Squid, and Vietnamese Spring Rolls! Kublai Khan Mongolian BBQ is a halal-certified restaurant. Mention a buffet at Marina Bay and you probably can’t help but imagine the exorbitant price tag that comes with the meal. Marina Bay BBQ Steamboat Buffet, however, gives restaurants in that area a run for their money as they offer seafood buffet from just $27+ per person. Located minutes away from Marina Barrage and Gardens By The Bay, the eatery is found in Satay By The Bay. 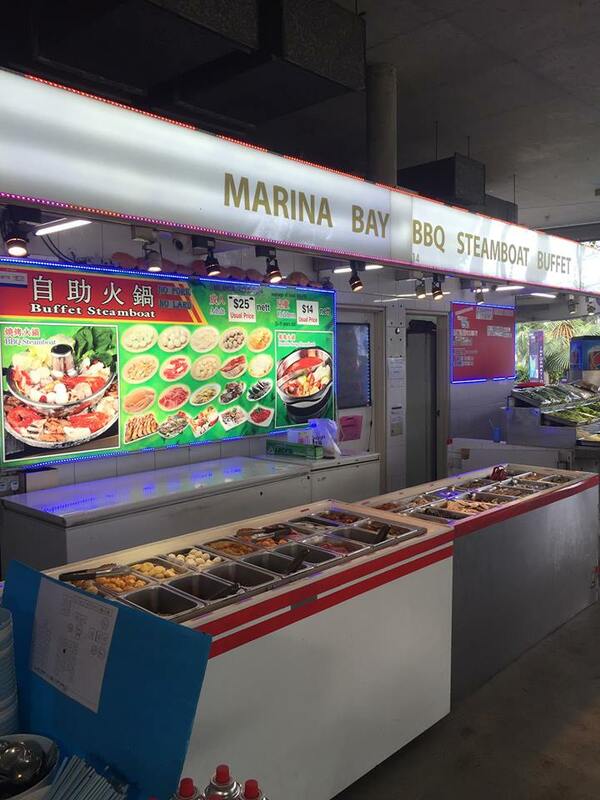 In terms of food variety, you can expect to find not just seafood, but also marinated meat, yong tau foo pieces, and vegetables. Besides free-flow soft drinks, the buffet also comes with complimentary ice-cream for you to end off the meal with something sweet! Marina Bay BBQ Seafood Buffet is a halal-certified eatery. There are not many halal Korean BBQ in Singapore, so we were glad to find out that the famous I’m Kim Korean BBQ at SOTA finally opened a halal-certified branch*! 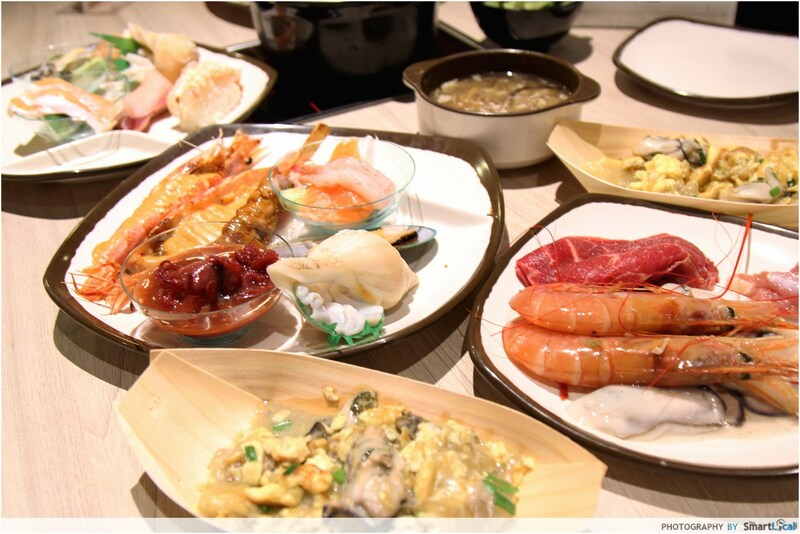 Situated at Tampines, Captain Kim Korean BBQ & Hotpot Buffet offers a slew of scrummy food. Their marinated meats include xinjiang mutton and peppermint beef, both of which are super scrumptious and will make you go back for more and more helpings. 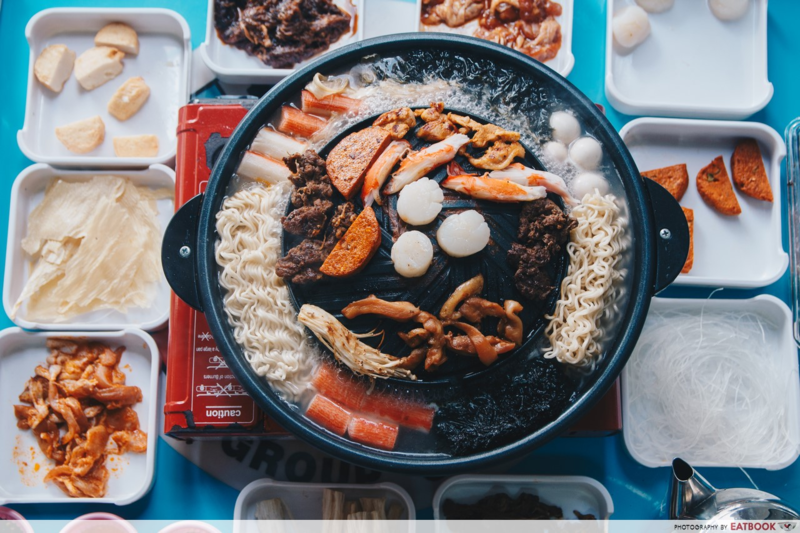 Aside from being able to grill your meat, you can even DIY your own korean army stew with free-flowing prawns, chicken franks, mussels and korean ramyeon. The place is constantly packed though, so be prepared to join the queue! If you think this is finally the time to start your diet, forget about it and just enjoy the coming months of feasting! While this list of halal buffets should suffice to last you till the next year, we also have a list of hotel seafood buffets for those who are looking for something more atas!